NOTE: Based on information from the CA DOJ, it is NOT acceptable to submit a DROS if the CA ID/DL has the "Federal Limits Apply" on it. It has been reported that US Citizens are getting their drivers license marked the same as the AB60 (illegal alien) DL when they renew their license online or do not provide the required additional documents when physically renewing at the DMV. In order to purchase a firearm you need to go to the DMV and provide the documents required to get the REAL-ID. I have also heard that it can take 3 months to get an appointment and it is unknown how long after that you will get an acceptable ID. You can also get a CA ID so that you have the required ID prior to your license renewing. Below is a brief summary of the transfer process, just so you get an idea of what has to be done. Sometimes things are a bit different, so feel free to ask if you have a different situation. NOTE: Marijuana is illegal under Federal law. Per the BATF if you have a Medical Marijuana card or you use marijuana, you are not able to transfer a firearm. Please do not have any firearms shipped for transfer as the transfer can not be completed. Any handgun must be on the CA DOJ certified list, with the exception of some firearms such as certain single action revolvers and private party transfers. Semi-auto longguns must be legal for CA and not considered a so-called "assualt weapon". See the CA DOJ web page for more specifics. Note: Due to issues with sales tax, I will not transfer any firearms from "penny auction" sites. The CA BOE says that sales tax is due based on the total the company receives for the auction (cost of all bids + the sale price + shipping), which is impossible to accurately calculate since the companies will not say how much money they received. This means that the only option is to use the highest cost for a bid. Please email me the information on the Transfer Request Form . I will mail (USPS, I don't fax my FFL) my FFL, which will take a couple of days, or email my FFL (now acceptable). PLEASE NOTE: I send my FFL as encrypted PDF, which the password is known information for the other FFL. This is done to prevent my FFL from being given out and provides a means for tracking where a person got my ffl from. Adobe provides a free PDF reader. Some Microsoft PDF readers are broken and are not able to open a password protected PDF. So please ensure that the FFL seller can open such a file. Waiting period of 10 days (240 hours from time DROS is submitted). After waiting period or near to the end of the waiting period, you need to arrange a time to pickup the firearm and complete the paperwork. Certified Lock and a Copy of the receipt within 30 days or Affidavit Stating Ownership of an Acceptable Gun Safe or Lock Box. Federal law requires handguns be transferred with a lock. 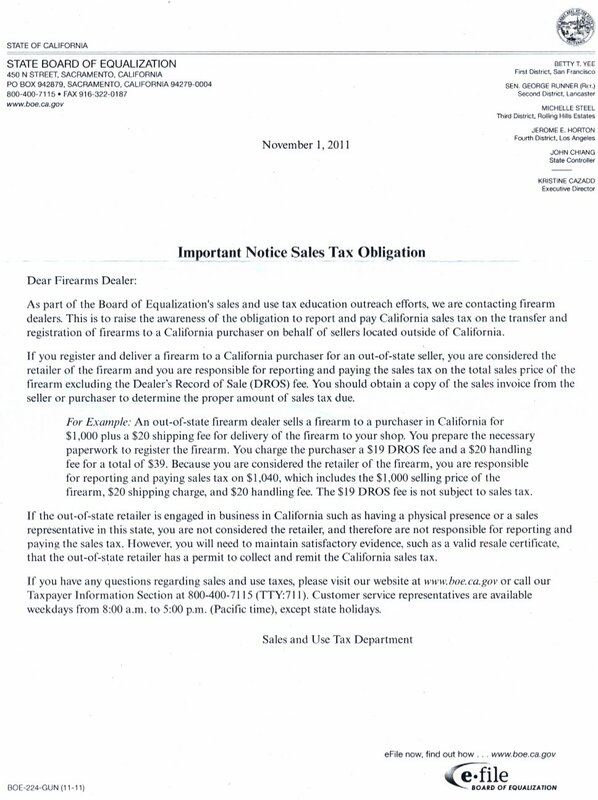 Letter stating that the firearm is from a private party, that it is an occasional sale and the seller does not have a business, if applicable (so that sales tax is not collected on the price of the firearm). This ONLY applies to purchases from within CA or if the firearm is a C&R handgun and you have a C&R FFL. It is best to have this letter before starting the paperwork. Please realize that I am providing this service as a service to the community since 1993 and it is not a full-time profession. This means that I am not always available and sometimes my schedule will demand a change in when you can start the paperwork and/or pick up the firearm. I also have a customer agreement (please click on and read) which needs to be signed, for my protection and to ensure a clear understanding of the fees. If this is not acceptable then I would strongly suggest that you use the services of another FFL. Cost + FFL Fee + DROS + CA Sales Tax (7.25% effective 01-Jan-2017, applies to FFL fee and perhaps firearm, see below). FYI: CA limits the fee for private party transfers to $10 and is defined as a transfer in which both parties show up at the FFL and fill out the required paperwork. The FFL fee is not a state fee. Buyer may be required to provide a dummy round or empty brass for the firearm safety demonstration. $20 discount per firearm with proof of membership in a firearms rights organization, such as the NRA, GOA, etc. (see links for some of the acceptable organizations), except for private party transfers. This discount is given at my sole discression and may not be given or cancelled at any time and for any reason. It does not apply to firearms left over 30 days without prior agreement. $20 minimum fee to deal with firearms which need special handling procedures, such as cosmoline coated firearms. $25 in addition to the Transfer cost only if you know exactly what you want and where to get it from (with limited exceptions based on the catalogs that I have). 100% prepaid in advance. No refunds after the order has been placed (very limited exceptions). Other orders by special arrangement. All business is done by appointment. If you are late for an appointment by over 15 minutes, there will be a charge of $60/hour with a minimum charge of $15. $25 ($19 + $1 + $5) for any numer of firearms transferred at the same time. In order to transfer a firearm, you need to either have a safe which meets the requirements of CA or you need to purchase a certified gun lock within 30 days of the transfer. Also, for the safe handling demonstration for handguns, you will need to provide a snapcap/dummy round (I have some calibers, but not all). Federal law requires a lock for handguns. For handgun purchases you need to have a HSC certificate, which is not the Hunter Safety Certificate, but the Handgun Safety Certificate. Effective 01-Jan-2015, you will need a FSC (Firearm safety certificate) for any firearm. The HSC will still be valid for handguns until it expires. $10/day, per item, for each item left for 30 days or more, charged from the first day. There is no storage charge for items picked up in under 30 days. Other storage by prior arrangement. Any firearm left for over 45 days (total) will be considered abandoned and will become the FFL's property. This and any storage charge may be waived by advance agreement or under unusual circumstances with independent verification. The reason for this is to strongly encourage the prompt pickup of all items.